We brought home freshly picked green beans from Story’s another wonderful local farmer’s market. I also picked baby Japanese Eggplants, about 5″ long, from our garden. 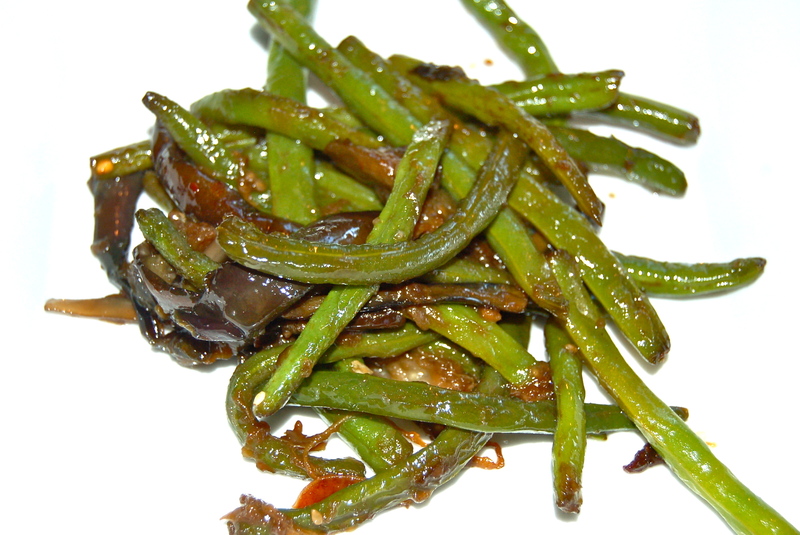 To complement our Asian dinner it was decided to do a stir fry of the beans and the eggplant. In Cathie’s opinion the Eggplant was overcooked. It’s been corrected in the recipe. 1. Heat the Peanut Oil in a wok. 2. Add the Garlic & the Ginger. 3. Add the Eggplant & saute until tender (don’t overcook) remove to a bowl. 4. Add the Green Beans & saute until starting to brown & become tender. 5. Return the Eggplant to the wok & toss it all together. 6. Add the TB of Soy Sauce, mix again & plate.